the interests of the breed and its owners throughout the world. 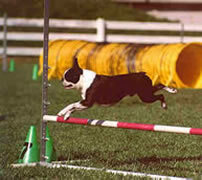 Boston Terriers are special dogs that can do special things. They are highly intelligent and learn quickly. They enjoy showing off in the conformation ring and do very well in Obedience, Therapy work, and Performance Events (Agility, Flyball and even Weight pulling!) Bostons excel in many roles. A Boston Terrier can be a child's rough and tumble best buddy, or a senior citizen's soulmate and confidante. Most of all they excell at being your "best friend"! However, they are not for everyone. Bostons require a lot of time and attention. They are and have been bred to be companions. They will langusih without human contact. They are not "outside" dogs! 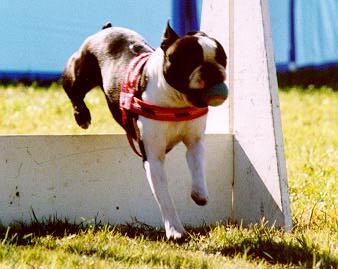 Boston Terriers are very active dogs that love to play. Without some basic training they may jump on you and maybe even give little nips while playing. Some Bostons have been given up for adoption or dropped off the local "dog pound" for these very reasons. Boston Terriers can also be prone to some health problems, many of which require expensive Veterinary attention. If you would like to know more about some of these health problems, please visit Boston Terrier Club of America's Health Committee. We are NOT trying to discourage you from having a Boston, We just want people to be aware as we have helped to rescue and place a few of these wonderful little creatures and do not want to end up needing to "rescue" any more. Please buy ONLY from a reputable breeder that has health clearances on their dogs. Here are just a few Boston Terriers pictured doing what they like to do best (which is to please people). Boston Terriers doing Pet Therapy work at a Nursing Home. The proud owner of the two Bostons pictured stated: "Rio is a 10 year old male who is a real character and was used a a therapy dog at a nursing home while he was a puppy. Rio has been featured on a promo video with a professional women's volleyball team in Mexico and he acted as a therapy dog at a local orphanage for abused & abandoned children." "Irish is a 8 year old female. Irish is my beautiful multi-champion and certified therapy dog. Irish has been in a TV commercial and a TV documentary about her therapy work." 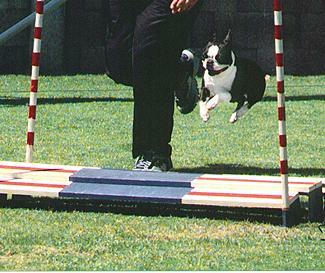 This is Boston is taking a jump on an Agility course. 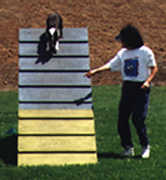 Taking the A-Frame on an agility course. Pretty fun, huh? Copyright © 2015. All Rights Reserved. Website by Prize WebWorks, Inc.